It's February and love is in the air this month. Join Maria Osende Flamenco on Thursday, February 14th for a very special Valentine Flamenco Night featuring a Flamenco Show & Dance! Megan La Azulita will present "With You"; a special Valentine's show debut featuring singer and dance partner Sean Andrews, singer Lisa Myers and guitarist Daniel MacNeil. Click here to see her live performance at the Vancouver International Flamenco Festival! The show will be followed by a salsa and bachata dance lesson by Audrey and Siggi and a dance party by DJ Regalia. All of this for just $20! We are also introducing, along with our regular admissions, a special reserved table seating option for couples or groups of four that includes a special "Flamenco Platter" and house wine. 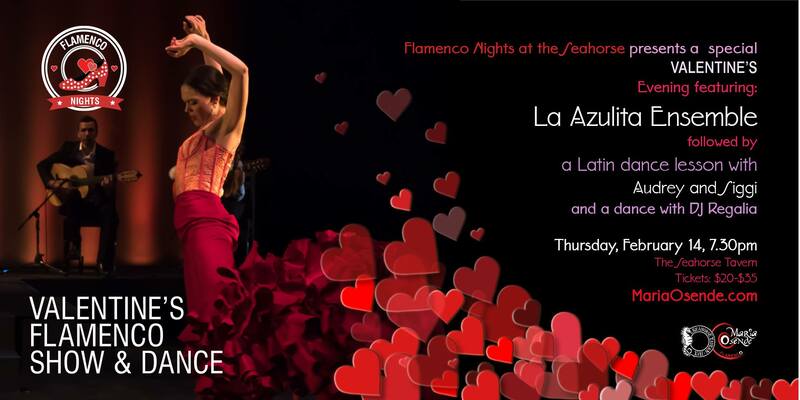 Whether you are single, a couple or simply a fan of our flamenco nights, this special evening is for you! Get your tickets today! 7.30pm doors open: Settle in and order some drinks and tapas from the Seahorse's new 2019 tapas menu! For the occasion we have special reserved table seating options available for 2 or 4 as well as our regular admission. Our Valentine's is for couple and for singles! Let's all enjoy this memorable day and share our love for flamenco! 8pm: Enjoy a wonderful flamenco performance by "La Azulita Ensemble" featuring dancers Megan "La Azulita" Matheson-Hamilton and Sean Andrews, singer Lisa Myers and guitarist Daniel MacNeil. The ensemble will be presenting "With You", a Valentine's special show. 9.30pm: Learn Latin dance (salsa and bachata) with Audrey and Siggi followed by a dance party with DJ Regalia. Go to our Facebook Event Page for more details.